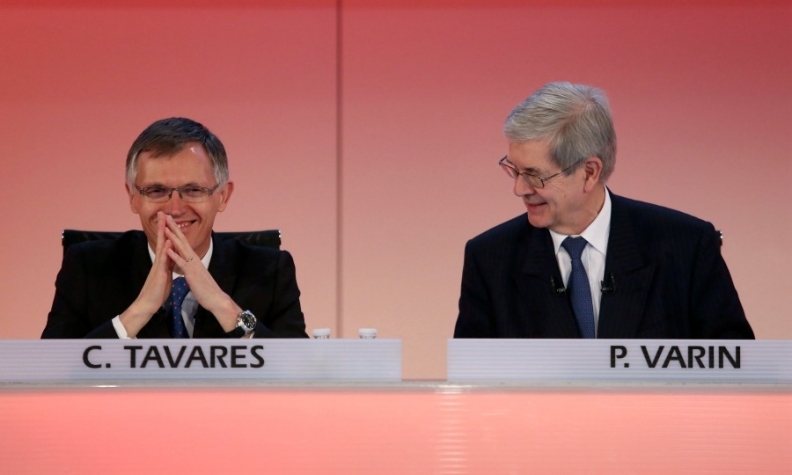 Carlos Tavares and Philippe Varin talk together ahead of a news conference to announce PSA's financial results today. PARIS (Bloomberg) -- Carlos Tavares, PSA/Peugeot-Citroen's incoming CEO, laid out aggressive plans to remake the unprofitable automaker's model lineup. Tavares, the former Renault executive who will take over as CEO next month, said PSA needs to increase research and development funding and narrow its offerings to focus on the most profitable vehicles. "This company has the potential to become a global car company," Tavares told analysts on a conference call today. He said his plan is to focus on fewer models and to "scare" competitors with the new vehicles in the coming years. Underscoring the long development times in the auto industry, where creating a new model from scratch takes years, Tavares said remaking the Citroen DS subbrand into a full-fledged marque that can compete with the likes of Audi and other luxury automakers may take two decades. The money for new models will come in part from a 3 billion-euro capital increase, in which Dongfeng Motor Corp. and the French state will contribute about half the money in exchange for stakes of 14 percent apiece. Banco Santander will also contribute funds through a partnership with PSA's lending arm. Tavares's strategy also includes narrowing PSA's offerings in countries such as Russia, where the automaker currently sells 27 models and is losing money. PSA has been forced to slash costs as Europe's auto market declined for six straight years and currently spends 1-to-2 percentage points less on r&d than the industry average. Tavares said he'll detail in mid-April his "Back in the Race" turnaround plan for PSA, which in the last decade has steadily fallen further behind regional leader Volkswagen Group. VW last year controlled 24.8 percent of the car market in western Europe, more than double PSA's 11.1 percent share. Ten years ago, the region's two biggest carmakers were much closer, with VW's share at 18.2 percent compared with PSA's 14.8 percent, according to data from industry trade group ACEA. PSA has largely stayed focused on mid-market cars in Europe, while VW has expanded the luxury Audi brand and invested abroad, especially in China. Since 2003, VW's global deliveries have surged 94 percent to 9.73 million vehicles, while Peugeot's have declined 14 percent to 2.82 million, according to data compiled by Bloomberg. PSA is aiming to remake its fortunes by teaming up with Dongfeng to expand in China, the world's largest auto market. Dongfeng, established in 1969 and based in the central Chinese city of Wuhan, already operates three factories in the country with PSA. The companies plan to raise joint production by two-thirds to 750,000 vehicles by the end of 2015. Dongfeng said today it's targeting 1.5 million in annual vehicle sales under its own nameplate and the PSA brands by 2020. "It's a good deal for both Dongfeng and PSA," said Han Weiqi, a Shanghai-based analyst at CSC International Holdings. "Dongfeng can tap PSA's core technologies and overseas network for expansion. For PSA, the investment helps them coming out of an imminent crisis." "We need to redefine a winning strategy in Latin America and Russia, which will require global products and low-cost platforms that will be localized in these countries," Chief Financial Officer Jean-Baptiste de Chatillon said on a conference call. The investment and debt-reduction packages will let PSA "invest in research and development and deal with our product plans" through 2019. PSA said Tavares will succeed Varin as CEO on March 31 after taking responsibility for group operations on Thursday. Tavares, 55, joined PSA in January in preparation for the appointment. Because of the automaker's current state, "there is humility in this company, and that is a strength because humility is a characteristic of champions," Tavares said.